Hi readers. Thanks for coming by for a read. That Israeli Jihad against Hamas and the Palestinians is just another example. Israel is confused and distraught. Nobody seems to understand them, including Hamas, which shoots at them. The UN and the International Community keeps telling them they’re violating International Law by occupying and putting settlements in the lands occupied. The world just doesn’t understand. Because the world hates Jews. So. What is ‘right’? Israel is occupying land that belongs so someone else according to the unanimous view of the rest of the world. The people who own that land consider the Israeli occupation an act of war. They’d approve of anyone doing anything to Israel out of retaliation in hopes of eventually getting what belongs to them back. Israel is an outlaw among nations. Declared itself to be by its own persistent behavior. And it is perpetrating its outlawry with new settlements on stolen land, attacks on the owners, and blaming everyone but themselves. and wept as we remembered Zion. Map of Israeli settlements (magenta) in the West Bank in 2012. 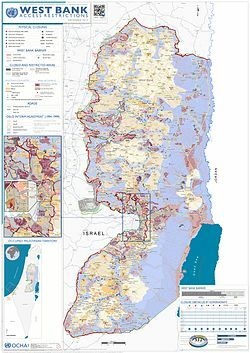 Israeli settlements in the occupied territories (commonly referred to as simply Israeli settlements) are the Israeli civilian communities[i] built on lands occupied by Israel during the 1967 Six-Day War. Such settlements currently exist in the West Bank, East Jerusalem, and in the Golan Heights. Settlements also existed in the Sinai and Gaza Strip until Israel evacuated the Sinai settlements following the 1979 Israel-Egypt peace agreement and from the Gaza Strip in 2005 under Israel’s unilateral disengagement plan. Israel dismantled 18 settlements in the Sinai Peninsula in 1982, and all 21 in the Gaza Strip and 4 in the West Bank in 2005, but continues to both expand its settlements and settle new areas in the West Bank, despite being condemned by 158 out of 166 nations in one vote, and 160 nations out of 171 nations in a different vote, in the UN. The international community considers the settlements in occupied territory to be illegal, and the United Nations has repeatedly upheld the view that Israel’s construction of settlements constitutes a violation of the Fourth Geneva Convention. 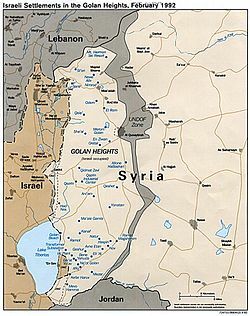 Israeli neighborhoods in East Jerusalem and communities in the Golan Heights, areas which have been annexed by Israel, are also considered settlements by the international community, which does not recognise Israel’s annexations of these territories. The International Court of Justice also says these settlements are illegal in a 2004 advisory opinion. In April 2012, UN secretary general Ban Ki-Moon, in response to moves by Israel to legalise Israeli outposts, reiterated that all settlement activity is illegal, and “runs contrary to Israel’s obligations under the Road Map and repeated Quartet calls for the parties to refrain from provocations.” Similar criticism was advanced by the EU and the US. Israel disputes the position of the international community and the legal arguments that were used to declare the settlements illegal. 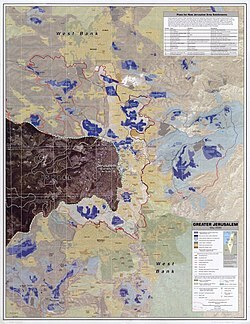 The presence and ongoing expansion of existing settlements by Israel and the construction of settlement outposts is frequently criticized as an obstacle to the peace process by the Palestinians and third parties, including the United Nations, Russia, the United Kingdom, France, the European Union, and the United States. In July 2012, according to the Israeli interior ministry, 350,150 Jewish settlers lived in the 121 officially recognised settlements in the West Bank, 300,000 Israelis lived in settlements in East Jerusalem and over 20,000 lived in settlements in the Golan Heights. Settlements range in character from farming communities and frontier villages to urban suburbs and neighborhoods. The four largest settlements, Modi’in Illit, Ma’ale Adumim, Beitar Illit and Ariel, have achieved city status. Ariel has 18,000 residents while the rest have around 37,000 to 55,500 each. This entry was posted in 2014, Adventure and tagged culture, gaza, hamas, History, Human Behavior, Israel, jihad, Life, politics, psychology, society, sociology. Bookmark the permalink. A blood feud that’s been going on for thousands of years, I’m glad you could pick a side! In the 1948-49 war that established Israel as an independent state, Jewish settlements on the West Bank were abandoned as Arab armies from Trans-Jordan invaded. Similar abandonment occurred in parts of what is today Gaza as Egyptian forces moved into the Palestine Mandate. Little remembered, it is today the foundation of the Settler Movement which has done more to damage Israel’s international reputation than any other action by the state. In 1967 when Israel fought Jordan, Syria and Egypt, conquering the West Bank, Gaza and the Sinai and the Golan Heights, those who remembered the settlements pre-1948 supported re-establishing them. This was done surreptitiously at first. First these points of occupation were military in nature. Then those servicing the military settled next to the encampments. Military budget money was used to begin to bring in infrastructure. And voila, in very little time, the Settler Movement had begun. Can Israel turn back the clock? Many in the country would like to but no one can agree on how far to wind it back? Also, when the Balfour Declaration by Britain ensured that there would be a Jewish Homeland in Palestine, those who migrated to the Mandate paid little attention to their Arab neighbours. It was as if they were not there. The onset of the Holocaust sped up the transition to a Jewish state with the survivors from Europe being added to what was in fact a minority presence within Palestine. Although never the majority until the War of Independence, a state within a colonial mandate was formed. The Arabs of Palestine never organized themselves cohesively in such a way as to offer an alternative. This proved to be a fatal error in state planning for an independent Palestine. Today, Israel is somewhat schizophrenic. A state born out of a perceived necessity as a safe haven, and yet a state that ignores the inequity it has contributed to by not assisting the Palestinians to become an equal partner within the state or an independent nation sharing a common geography. The only solution to Israel and Palestine is one that is imposed upon both parties by a supra-national organization with the muscle to back it up. The United Nations which initially endorsed the existence of Israel has failed through the Cold War era until today to create an instrument of authority which could be used to bring an end to this conflict. Islam says to KILL all the Jews and Christians and anyone else who won’t become Muslims. There will never be peace until the Prince of Peace returns. So it won’t matter is the UN sends forces to force peace the Hamas and other terrorist organizations of Islam will continue to wage war against Israel and the US and others who are not Islamic. So, I”m buckling my seat belt and hanging on for the ride. Blessings, M.
May God bless and help Israel. Go to hell Hamas terrorist!